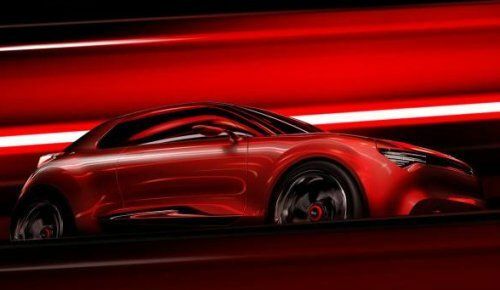 Kia Motors has just issued a brief press release and a collection of artwork teasing an unnamed vehicle that the Korean automaker refers to simply as “a new urban concept car” – with the formal debut of this curvy concept slated for the 2013 Geneva Motor Show. Almost no information is offered with the teaser shots of the Kia Urban Concept Car shy of the company’s aim with the styling and a focus on a few key points like the headlights, the grille and the body lines. There is no mention of the drivetrain but the simple fact that it is an urban concept car leads me to believe that this is a compact car designed for city use. The round lines and large looking wheels make it hard to tell whether this is a compact hatchback or a small crossover but if I had to make a bet – it looks more like Kia is planning a “hot hatch” concept for the Geneva Motor Show. Right now, the smallest car that Kia sells is the Rio which is available as either a sedan or a 5-door while the only 2-door model in the lineup is the sporty Forte Koup. Provided that this is a 2-door compact hatchback, it could be smaller than the Rio 5-door while offering more cargo space than the Forte Koup so for someone who wants a compact Kia 2-door with more versatility than the Forte – this urban concept car could be the answer. A hatchback of this size would compete in the US with vehicles like the Fiat 500 and the Scion iQ; a segment that is growing quickly and one in which Kia does not currently participate so a new compact 2-door hatch would fit into their company lineup. The exterior design of this Kia urban concept car is wild with a front end that really doesn’t look like anything that will arrive in showrooms any time soon but an interesting key feature of the front end is the lack of openings for proper engine cooling. There is a small grille area running between the high tech headlights but it almost looks like it is filled in. While this could simply be Kia’s way of keeping some of the aspects of the vehicle secluded until the public debut, this lack of a large grille opening makes me wonder if this might not be an electric vehicle. Electric vehicles do not need the same amount of cooling air as traditional gasoline powered engines so many EVs have more solid front ends for improving aerodynamics. While many people are fixated on the sharp exterior design – perhaps the bigger news around the Kia urban concept car is an electric drivetrain? We are quick to assume that “urban” relates to the overall size of the vehicle but electric vehicles are marketed more towards those who live in dense urban areas so perhaps this curvy concept will feature a new electric drivetrain. There is also the possibility that I am wrong and this urban concept car is powered by a traditional drivetrain but until this car debuts in Geneva, we will be left guessing. The 2013 Geneva Motor Show runs from March 7th through March 17th with the media only days being on the 5th and the 6th. This means that it will be over a month until we see the premier of this new mysterious Kia “urban concept car” but with a collection of pictures this far out, perhaps the Korean automaker will offer more information ahead of the full debut in Geneva.